I have been anxiously awaiting my review copy of Earthbag Building: The Tools, Tricks and Techniques by Kaki Hunter and Donald Kiffmeyer for quite some time, and am pleased to now have the chance to review it. Published by New Society Publishers, this book should find wide distribution and many fascinated readers. 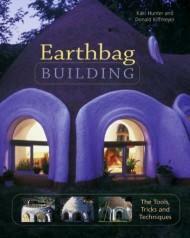 Having built my own home using earthbags, I have a fondness for this method of building and am a proponent of its use. Doni and Kaki (as many of us know them) came to earthbag building via a workshop with Nader Khalili of The California Institute of Earth Art and Architecture, who is the father of modern earthbag works; he calls the technique Super Adobe. This fact is key to how the authors relate to earthbag building: as far as they (and Nader Khalili) are concerned, the bag itself is merely a form into which adobe soil is placed and allowed to cure into a hard, solid earthen block, which then becomes part of a structure. Ultimately, the bags themselves are not considered to be structural…only the solid adobe within them. The initial chapter that describes appropriate materials for earthbag building goes into how to find or prepare the right mixture of sand and clay to make good adobe soil to fill the bags. The tools and tricks that they describe all follow from the intention of using adobe soil as the basis for building. The methods for insulating earthbag walls that are suggested in Earthbag Building lack the elegance of simply filling the bags with insulating material in the first place. As far as I am concerned, one of the true merits of earthbag building that is not duplicated by any other wall system is the fact that the bags can be filled with a wide range of materials, according the their availability and function within the design of the structure. While loose material does not compact and solidify in the same way that adobe soil does, it will compact sufficiently to remain static in the wall, at least until both sides of the bags are plastered, at which point the wall ideally becomes monolithic. The only exception to this that I have experienced is with filling the bags with very fine, slippery sand, which does tend to shape-shift in the bag. The same principle that makes structural insulated panels (SIPs) so amazingly strong is at work here: a soft core of insulation is clad with tough skins of tensile material, and you can build whole houses with them with hardly any other framing. Earthbag Building provides a good foundation for the basic concepts of building this way, starting with the foundation itself, and proceeding on to examine appropriate design features for walls. The merit of curved walls is clearly stated, as is the need for buttressing straight wall sections. The placement of barbed wire between the courses and how to keep it from being too unruly is covered. How to build corners, columns, door and window openings are all clearly shown. Even ideas for incorporating post and beam framing into an earthbag wall is discussed. I am particularly impressed with their use of “Velcro plates” of spiked wood inserted between the bags as a way to anchor door frames or other wall attachments. Also their use of wire mesh “cradles” where the bag ends are exposed, as under arches, makes a lot of sense for giving the eventual plaster something to hang on to. There are chapters on exterior and interior plasters, which they have much experience with and have many useful tips and recipes to reveal. There is a short chapter on poured adobe or rammed earth floors. There is a whole chapter outlining a variety of roof systems that can be integrated into an earthbag structure but, Doni and Kaki claim that domes are “where earthbags exhibit their greatest potential; to us, it is the essence of earthbag building. We are able to build an entire house from foundation to walls to roof using one system.” I agree with them about this. The physics and geometry of dome building is well covered. They provide a step-by-step illustrated guide to how they built their 12 foot interior diameter “Honey House” dome. When I compare my own experience of building my earthbag house with what is presented in this book, I would say that for the most part it is similar, but there are some significant differences. There is a degree of precision advocated by the authors that seems excessive to me. For instance, they use a fairly elaborate compass arrangement for placing the earthbags in circular or domed structures that assures a refinement that ultimately is a matter of aesthetics, not structural necessity; I accomplished the same measurements with either a piece of string or a length of pipe. All of this precision takes time, which at least partly accounts for the fact that they suggest that on average one trained person can fill and lay only four bags in one hour. I easily proceeded at twice this rate, working by myself, but this is also because the bags of scoria only weigh about 35 lbs each, so they can be quickly filled on the ground, carried to their location on the wall, put into place without the need of metal sliders, and tamped tight with a few slams of a large steel tamper, and then it is on to the next bag. Laying earthbags filled with adobe in the manner described in this book would be extremely cumbersome, if not impossible, by one person; they recommend crews of at least three people. In the end the reader is given a wealth of information, gleaned from the authors’ hard experience, in a manner that is quite readable and clearly illustrated. I can recommend Earthbag Building for anyone thinking about building this way, as long as the perspective is taken that what they present is only one of many ways that earthbags might be utilized for construction. Anyone interested in listening to a discussion about sustainable architecture or hearing my voice during a live interview is welcome to tune in to the "Conscious Living" program, thursday at 10:00 a.m. PST on www.voice.voiceamerica.com. It will be re-aired at 10:00 p.m. thursday on http://www.health.voiceamerica.com/ , then archived under the show title/host (Samone Myers of The Center for Unified Research & Education at http://www.earthcure.org/.) This is a one-hour program, with a format that sometimes allows for listener call-ins.